Crown of Aragón is Coming to Kickstarter! 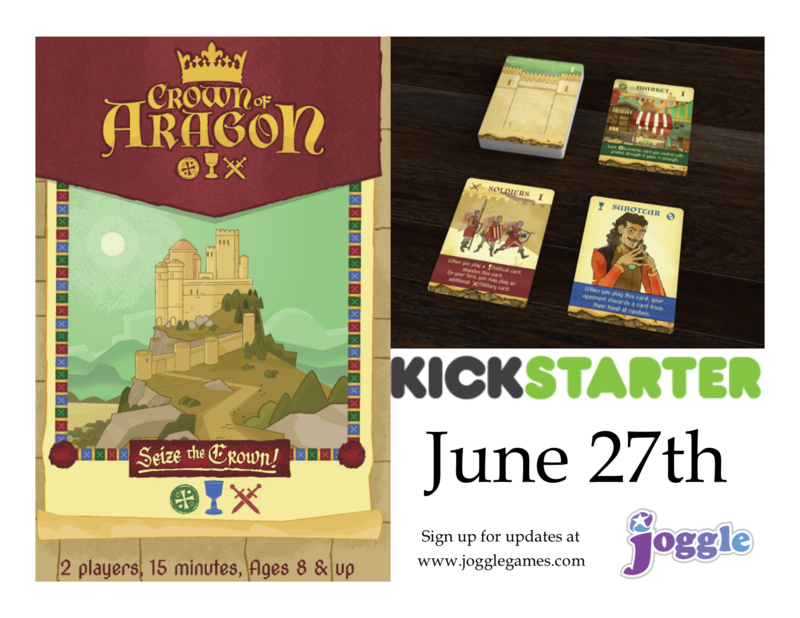 If you subscribe to our mailing list you already know this, but if you don’t we’re excited to let the world know we’re bringing Crown of Aragón to Kickstarter on June 27th! We have so much content for Crown of Aragón ready to be produced, we love this game and we want to get it into the hands of more people. After much discussion we decided that Kickstarter was the best fit to do that! What’s different from the Preview / Print on Demand version? All the cards and art in the main deck will be the same as the current version. We’ll be adding (at least) two main things to the box: 6 new leaders (like the promo cards but different) and influence tracking boards to use instead of dice. We have some other cool things we’d like to include but that’s what stretch goals are for, right? Will there be exclusive content for the Kickstarter? No. While the new content will be available to our KS backers first, everything will be made available to everyone at some point in the future. It will most likely not be possible to make the box or components from the Kickstarter edition available separately, but we will make any new cards we include available via print on demand after all Kickstarter backers have received their rewards. We’re launching on June 27th at 7PM EST. If you want to start helping right now you can direct your friends to sign up for our mailing list, follow us on Facebook/twitter, or just subscribe to updates on Board Game Geek. Thank you to everyone who has already supported us by buying the preview or print on demand version of Crown of Aragón. We’re really looking forward to expanding this game long into the future.